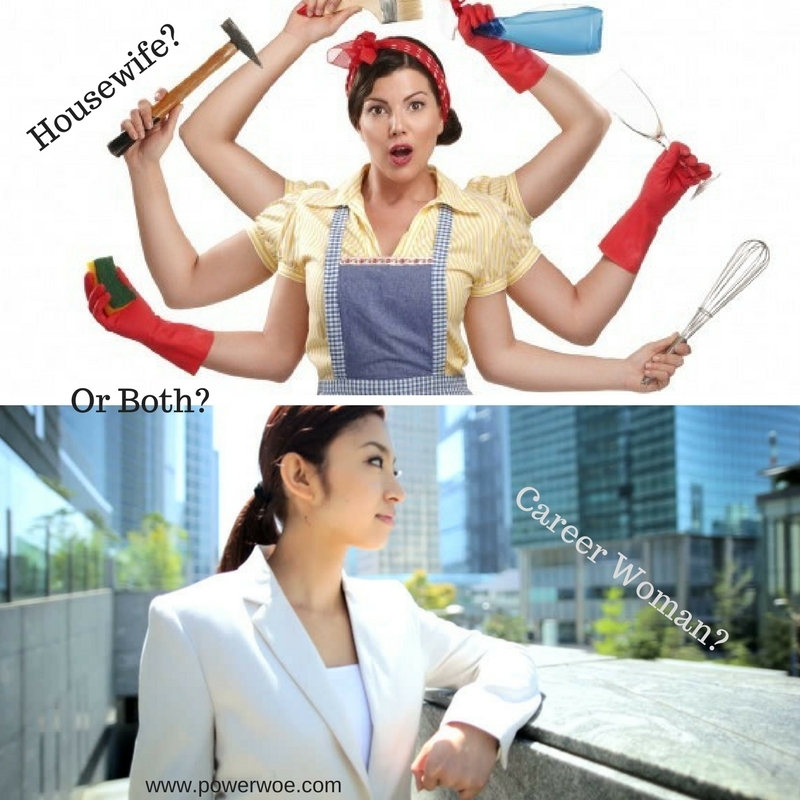 P.O.W.E.R Asks: House Wife, Career Woman or Both? Who are women today? Are we housewives, career women or are we both? As women, we are very hard on ourselves when it comes to trying to prove we can do it all and do it flawlessly. Many of us feel we need to prove that we can multitask and take on any challenge. Back in the day, women took care of the home and the children. The main objectives of their day were that their home was clean and tidy, their children were well cared for and a home cooked meal was on the table for their families come dinner time. The Women’s Liberation Movement changed those expectations. From the 1960’s until today’s #MeToo movement, women have always been under pressure to accomplish more and to be more successful in the workplace. According to a study commissioned by Welch’s Grape Fruit Juice, if you add up the time the average working mom spends at her paid position and her duties at home, it totals 98 hours per week. That’s equal to, if not more than, two full-time positions. In the past, the husband was the breadwinner and the wife was the homemaker. Women now share the role of breadwinner and, in many cases, are the sole providers, while at home they are still carrying the brunt of the workload. Many women happily pursue the careers of their choice. Then there are other women who take on a career due to financial constraints. They continue to work because their family needs their salary to survive. Not all of these women have glamorous jobs or phenomenal careers. They go to work each day to put food on the table, plain and simple. Then they go home and still perform all the household duties that the traditional housewife would do. They cook, they clean, they do laundry and they tend to their children. Still others are choosing to follow a more traditional path once motherhood is on the horizon. They scale back at work once a child arrives, sometimes even choosing to go part time. Additionally, there is a small percentage that still chooses to stay home to mother full time. Betty Friedan, known as the “Mother of the Modern Feminist Movement” helped women who felt oppressed to have a voice. That voice helped women to enter the workforce and have careers, but it has not helped them engage their husbands to share in the domestic duties and child rearing, especially when both are full-time workers. There needs to be a shared balance in the home so that women are not burning out from working two full-time jobs. Regardless of the chosen path, being a woman in today’s world is no easy task. No matter what path they follow, all these women have full-time jobs and maybe more. The pressure to succeed in the workplace is enormous. The pressure to succeed as a parent is daunting. The pressure to prove to ourselves and society that we can indeed do it all can be overwhelming at times. We all seem to struggle to find that ideal balance of work and family life. Many women are fortunate to have a husband who helps in the home, but for those that do not, it is time to use your voice and realize it is okay to ask for help. It does not make you a “bad mom” to have help. It actually makes you a better mom because you are able to engage in the home without the burnout and exhaustion. So who had it better, the women of yesterday or the women of today? Who has it better, the working woman or the full time mother? Honestly, there are pros and cons to every choice which is why there is no “one size fits all” answer, especially for those women who don’t have a choice in the matter. In today’s society, you are either a house wife, a career woman, or both.